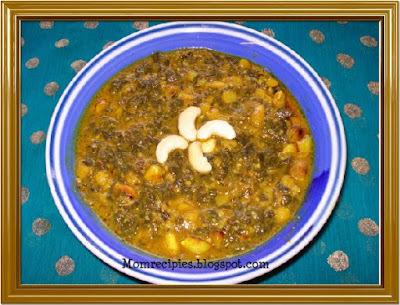 Patal Bhaji is an extremly popular Maharashtrian curry.Spinach is cooked with Chana dal and peanuts. 1. Wash and finely chop the spinach leaves. 2. Soak Peanuts and Chana dal in water for 4-5 hours.Pressure cook Chana Dal, peanuts along with 1 tsp salt upto 3 whistles. 3. In a kadhai heat the oil. After the oil is heated up ,add mustard seeds,after they crackle add hing (asafoetida), fenugreek seeds,garlic flakes,green chillies paste ,turmeric.Fry for 10 seconds.Mix well. 4. Add Chopped Spinach and besan (chick pea flour).mash it with wooden dal masher or ravi till all lumps are removed. 5. Once spinach gets mashed add pressure cooked mixture into this kadhai. 5. Add cashews ,goda masala,tamarind pulp and jaggery ,salt to taste,little water. 6. Allow to boil for 5 minutes.Mix well. 7. Garnish with fresh coconut if using. 1) Palakachi Patal Bhaji should be deep green and of semi thick in consistency. 2) Colocasia leaves /Taro leaves (Aalu) can be substituted for Spinach. I hav eneve rhad this, it sounds so good especialy with cashews and peanuts in them.